Steve Ottersberg is driven to change the way the world sees cannabis. He’s hoping to destigmatize the cannabis industry to allow more individuals to benefit from the use of CBD and cannabis for everything from anxiety and sleep to depression and cancer. 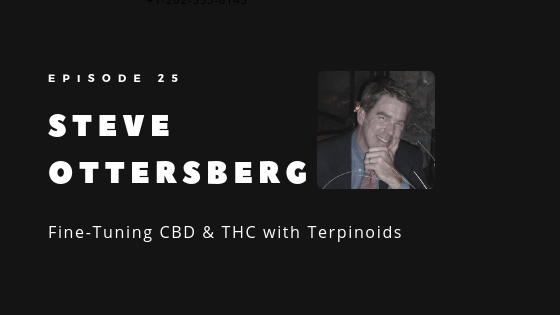 Steve believes that consumers should understand and be armed with information on which terpenes are beneficial for their medical condition and whether or not they are contained in the product they are purchasing. Have you ever wondered why some strains of CBD or THC make you feel either high or low? Ready to go beast mode, or ready to hibernate for winter? Steve shares what makes the effects of the different strains more or less beneficial for different conditions and why he doesn’t believe in the classification of Indica or Sativa anymore. This is one episode you won’t want to miss! Steve Ottersberg graduated from Fort Lewis College with a B.S. in biochemistry and has an M.S. in Bio-organic chemistry from Arizona State University, where he also taught both organic chemistry and nutritional-biochemistry. He also held a faculty position teaching chemistry at Fort Lewis College. Currently, Steve is Owner and Supervisory Analyst of Green Lab Solutions, living in Colorado with his wife, cancer survivor and thriver Dr. Nasha Winters, whose work (she is also the author of The Metabolic Approach to Cancer) complements one another.